Teach them how to wield the internet for good. With the mere words “social media” striking fear in most parents’ hearts, it’s easy to get mired in the dark side of the internet: bullying and trolling and wasting time … oh my! We can’t keep our children off social media forever, however, so why not show them how to use the powerful communication tool to make people actually feel good about themselves? An act of kindness often leads to gratitude—and even scientists agree there are many benefits of that, including greater happiness, stronger relationships and an improved ability to deal with adversity. And what better time to start spreading online kindness and gratitude than National Random Acts of Kindness Day on February 17? To help you kick it off, here are 10 social media ideas you can easily do with your kids. 1. Leave a positive comment. There is no shortage of toxic remarks from faceless strangers, emboldened by their anonymity, left on social media posts. Combat that negativity and lift somebody’s spirits—whether it’s a family member, friend or a boy who happens to enjoy posting makeup tutorials—by taking the time to offer a heartfelt compliment. 2. Create an upbeat post. Social media is a popular place to commiserate about everyday frustrations. While that can be therapeutic, the sheer volume of frustrations we come across can also become tiresome. Inject some positivity by brainstorming a post that inspires hope, happiness and/or a giggle, whether it’s a quote or an original drawing, and creating it with your child to share with your followers. 3. Send an e-card. This might seem old school, sure, but most e-card sites (such as JibJab and Hallmark) also allow you to send a card via Facebook—a sweet way to let somebody know you’re thinking of them. 4. Write a glowing review. Maybe your family enjoyed a fantastic meal at that new Italian place down the street. Or the local dry cleaner went above and beyond to have your favorite dress ready by the next day. Posting a complimentary review on Yelp or Facebook can go a long way in bolstering small businesses. You can even ask your kids what their favorite local hangout is and write a complimentary review together. 5. Donate toys and clothes. Although it can be hard to pry old stuffies and shirts that have been long outgrown from the hands of little ones, work together to set aside some items to donate and post them on a neighborhood Facebook page and/or a page that supports local foster families (a quick search by city usually reveals them, if available). As a certain famous organizing expert would say, give them to somebody for whom they’ll spark joy! 6. Start a pay-it-forward chain. Perform a random act of kindness offline—such as putting coins in an expired parking meter or leaving coupons in front of corresponding products at a store—and post about it, encouraging others to pay it forward and share how they did so in your comments. Hopefully, they’ll encourage their social media communities to follow suit. And boom! Pay-it-forward chain: activated. 7. Support a cause. Talk with your kids about the importance of supporting charities and nonprofits, which are increasingly relying on social media for donations, and select a worthwhile cause that’s near and dear to your hearts to help by sharing their mission and/or donating. Perhaps go a step further and hold a lemonade sale—which you and the kids can advertise to neighbors on social media—and donate the proceeds to that charity online. We’d raise a cup of lemonade to that! 8. Express how much your teacher rocks. You don’t have to wait until Teacher Appreciation Week to shout your love from the rooftops. Encourage your kid to drop a sweet comment about his/her teacher on the school’s Instagram account or sing the teacher’s praises in an e-mail to the principal. Because every day should be Teacher Appreciation Day. 9. Share a blog post. If you’re a fan of a lesser-known blogger, raise their visibility by sharing your favorite blog post. It can be hard for bloggers to gain traction in a World Wide Web overflowing with animal videos and car rants, and you’d be doing them a solid by helping them break through the clutter. 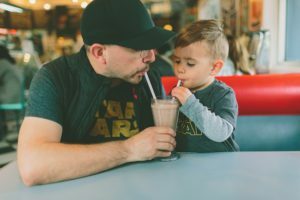 Try to pick a post you can discuss with your kids, if possible, and explain why you enjoy it—potentially igniting a dialogue about what kinds of online content make them happy (and try not to roll your eyes if they enthusiastically launch into why they can’t get enough of watching kids open Kinder Eggs on YouTube). 10. Thank a service member. Search for #veteran on Instagram, and you’ll find many public profiles of brave men and women who’ve served in the military. Let them know how much you value their sacrifice and selfless service to our country with a simple, appreciative note. This article was written by Candy Kirby from Working Mother and was legally licensed through the NewsCred publisher network. Please direct all licensing questions to legal@newscred.com. “Be nice, and don’t be a bully.” Chances are your kids hear that all the time—at home, at school, or during their after-school activities. Instead of making kindness just another rule, what if we showed kids that it’s a superpower they can choose every day to make both themselves and others feel good? Words matter. What does your child have to say? Ask what kindness means to them and help them choose someone to surprise with a kind note. A new classmate, a friend, or a teacher’s aide are all great choices. Your child’s note can be anything they want it to be, from a kind word on a piece of paper to a homemade card or letter you put in the mail together. Grab some colorful sticky notes and pens. Ask your child to fill them with encouraging compliments like “You’re awesome”, “You can do this”, or “You’re a good friend.” Tell them you’re collecting them for someone special as a surprise. When your child isn’t looking, add their name to the notes and hide them around the house for them to discover. The next time you’re taking a walk with your child, collect a few items of litter together. It’s a great time to have a conversation about how each of us has the power to make the world around us more beautiful. You can do this act of kindness in so many places—from the playground to the parking lot. While there are no guarantees, your child might just take a little more interest in keeping their toys from “littering” the carpet. The more kind acts kids witness, the more ideas they’ll have for kind acts of their own! The next time you’re out running errands together, make a game out of spotting acts of kindness. This article was written by Melissa Burmester and Jaclyn Lindsey from Parents and was legally licensed through the NewsCred publisher network. Please direct all licensing questions to legal@newscred.com. Learning to share is important, but it can be challenging to convey this to children. Dr. Kyle Pruett, clinical professor of child psychiatry at Yale School of Medicine and member of The Goddard School Educational Advisory Board, offers four ways to encourage children to share. As is so often the case, children grow to give what they have received. Valued and generously loved children find it much easier to be generous to others – in due time. Parents who behave generously (and talk about it) help their children develop the language of sharing early on. Phrases such as “Want to share my grapes?” or “I’d love it if I could share your orange, okay?” afford your child the chance to hear the vocabulary of sharing in the context of positive emotions like appreciation and generosity. This helps children begin to understand that generosity is a way of staying emotionally close to the people they want to stay close to. Avoid parent-enforced sharing whenever possible. The umpire is the least popular position in any sport or family. Acting as the referee supports the fantasy that, when a child wants something another child has, you can make things fair or right by forcing that other child to share. Instead, whenever you can, use the huge power of your affection to comfort the child, reassuring him you are staying right there and helping him wait for his turn. When you catch your child sharing, which they are more likely to do with younger, less intimidating peers, praise her for it, tell her how proud you are that she shared. This works far better than teaching or trying to make children share. Children in mixed age groups often find it easier to share than those who interact with their peers. 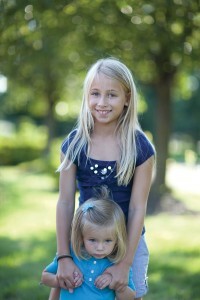 Older children are usually less territorial and more likely to share, which can be a cue to younger children to share. These moments should be met with praise.